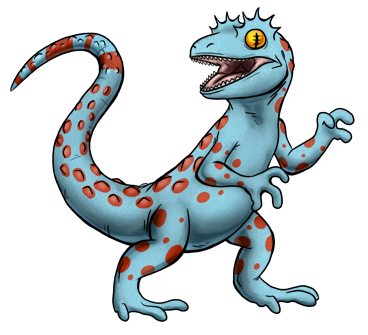 Geksaur is the meta-form of Gekkoid. Upon reaching this stage in its life cycle it has grown a long prehensile tail which has a battery of glands that can spray sticky jets of nasty electric slime. During the day it hides in hollow trees or crevices, waking up at night to hunt. Its eyes are protected by translucent scales instead of eyelids, which it will lick clean with its tongue. With its adhesive paws it can climb on nearly any solid surface, tear off tracts of an opponent’s skin with a brutal sticky slap, and even siphon an opponent’s power. Most Tamers consider this Kreature to be worthless because it has a rotten attitude and a stubborn will that belies its rank. What can I say about Geksaur that I haven’t already said? A lovely lizard monster through and throgh.